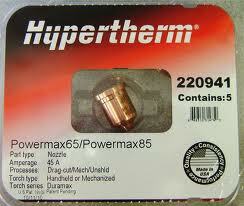 Hypertherm 220941 45 amp plasma cutting Nozzle pack 5 used with the powermax 45 XP, 65, 85 and 105 plasma cutters. Genuine Hypertherm 220941 45 amp plasma cutting Nozzle, used on the powermax 45 xp, 65, 85 and 105 with duramax plasma torch, and older machines with retrofit duramax torch. Used with hand and mechanised cutting systems .